Final free practice was shortened after delays to the start. The medical helicopter couldn’t take off due to poor visibility, but thankfully all was right once qualifying got underway. The first session held a surprise, as Romain Grosjean was knocked out after just seven laps. The Lotus team left their driver on the medium compounds, while everyone else was on the faster softer tyres, and his Saturday afternoon running was over before it could begin. Teammate Kimi Räikkönen made his way through to the top ten, but could get no higher than sixth. Ahead of him, Sebastian Vettel scooped another pole position, stopping the two Mercedes drivers progress - Nico Rosberg was second and Lewis Hamilton third. 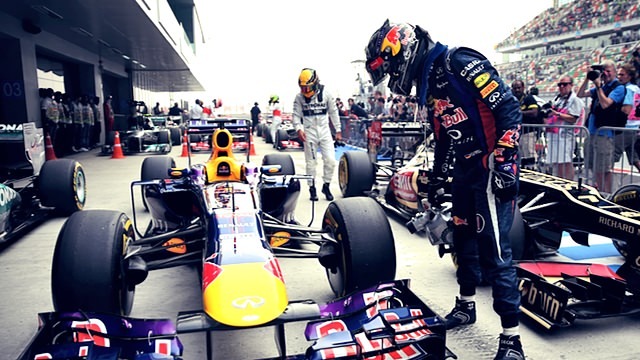 Mark Webber, in fourth, opted for mediums in the final ten minutes, as did Alonso, Pérez and Button (eighth through to tenth), so strategy during the first part of the race will really make a difference. Meanwhile, Nico Hülkenberg had another good qualifying in seventh, whilst Esteban Gutiérrez dropped down to 16th. The Force India pair settled for 12th and 13th, and Felipe Massa outqualified Alonso for fifth place.